Tomato-peach flatbread is the perfect summer appetizer. 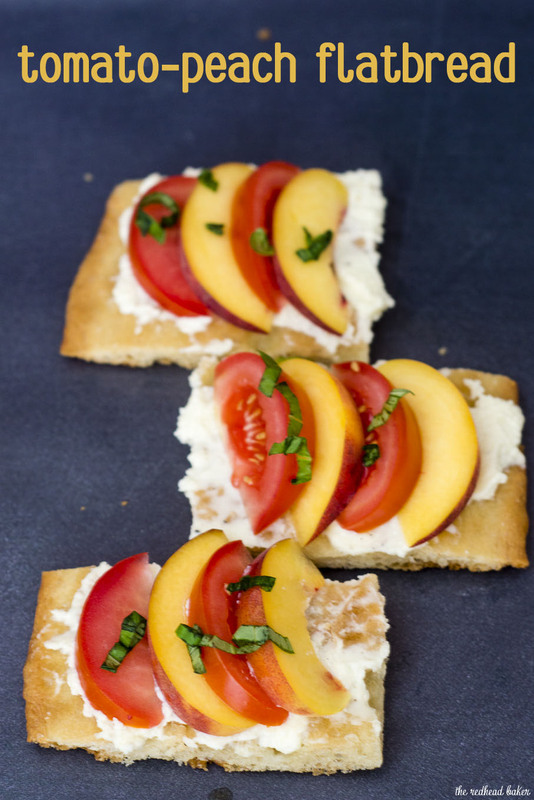 You can’t beat fresh summer tomatoes and peaches, plus no cooking required! After all those delectable peach recipes shared last Sunday, are you ready for another one? 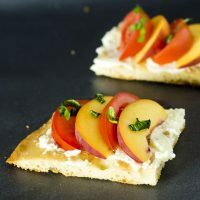 Peaches are my favorite summer fruit, so I love trying new recipes that use them. The first time I heard of a recipe that combined tomatoes and peaches, I was skeptical. Tomatoes …. and peaches … ? Would those taste good together? Turns out, the answer is a resounding yes! 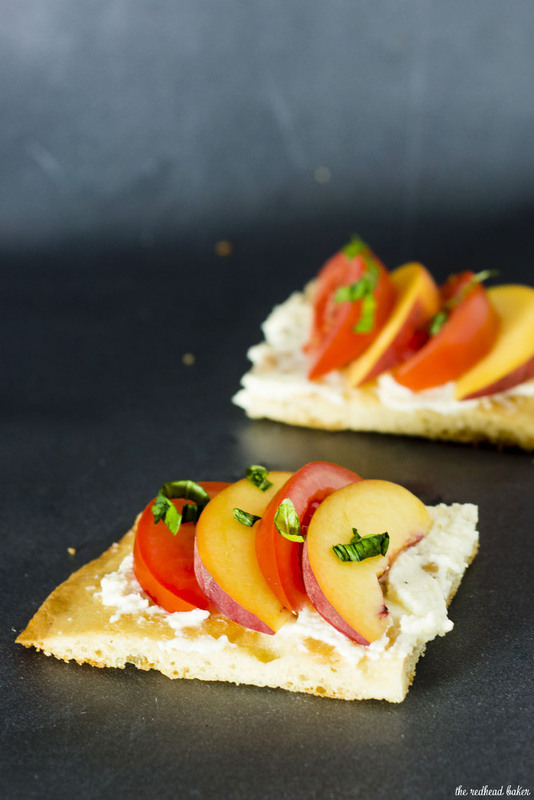 This appetizer is perfect for your next summer get-together or party. It’s so incredibly easy to make, and uses fresh summer produce. For the flatbread, I made my own at home, using this recipe from the Food Network. You can also use na’an, thin pizza crust, or any other flatbread you prefer. Then, the cheese. I had a tub of mascarpone on hand, so I used that, but cream cheese, ricotta cheese or any other fresh, spreadable cheese would work well. Blending it with olive oil, salt and pepper increases the savoriness of the appetizer. Then, the cheese is topped with thinly sliced fresh tomato and peach, and basil cut chiffonade, which means into thin strips. If you buy your flatbread at the grocery store, this entire recipe is no-cook! These were so addictive, I ate three in one sitting. I cannot wait to make them again! 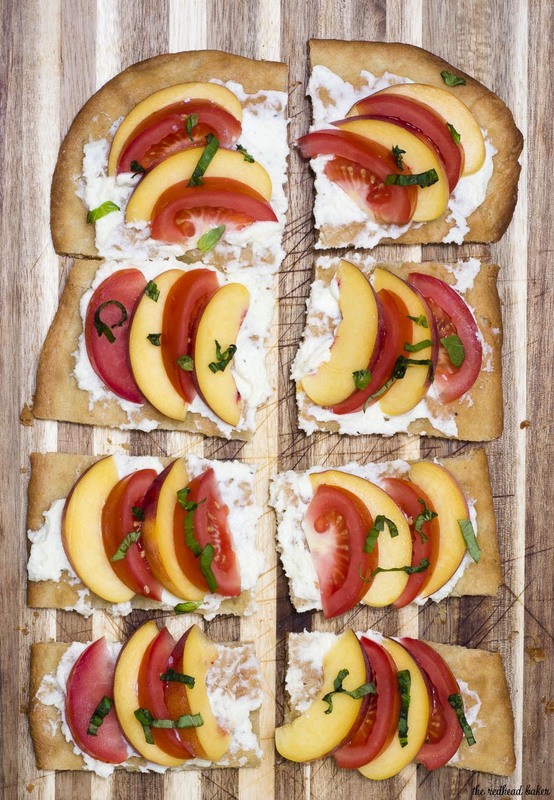 Pin this recipe for Tomato-Peach Flatbread for later! In a small bowl, whisk together the mascarpone and olive oil, then season to taste with salt and pepper. Spread the cheese mixture in a thin layer over the flatbread. Cut the flat bread in half lengthwise, then cut each length into five pieces. 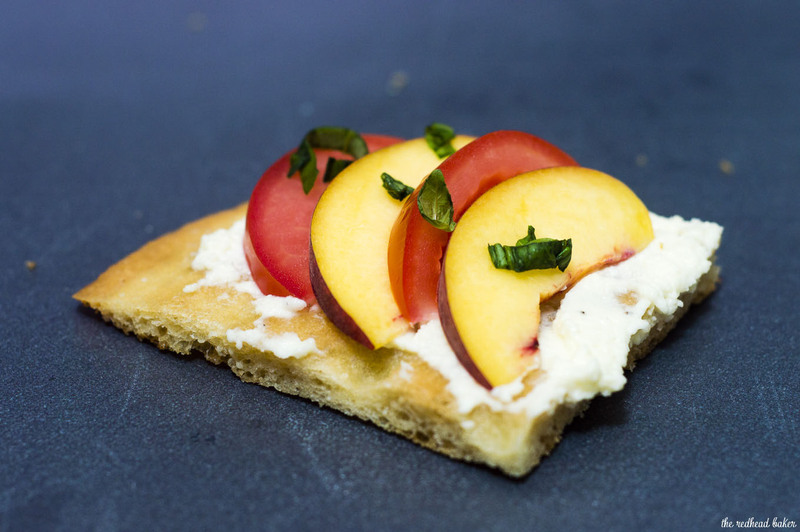 Layer two pieces of tomato and two peach slices onto each flatbread piece, then sprinkle the basil over top and serve.